Previously we mentioned about Skyfire 2.0 that enable flash playback but was “temporarily not accepting new purchases”, good news now that the app is finally available for download with certain feature enhancements. 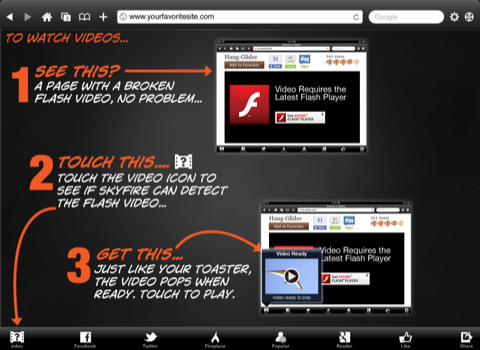 Flash Video playback – There is a ‘Video’ icon that allows users to play millions of Flash videos (which was initially cannot be done on iOS devices), thanks to its servers that transcode Flash into HTML5 contents. Facebook QuickView – It provides one touch access to your Facebook profiles with supported news feed, updates and etc. Twitter QuickView – Similarly, it allows faster access to your twitter feed with ability to update current status and location without leaving the browser. Fireplace Feed Reader – It provides a filtered list of your Facebook feed including only those browsable links, images, videos posted by other Facebook users. Popular Content – It lists down all the popular famous contents voted by 500 million Facebook community users with prioritized lists given to recommendation from friends. Google Reader – Quick access to Google Reader feeds on top of Gmail, Calendar, Docs, Buzz and etc. Private Browsing – Can be enabled on a per tab basis so no history or cookies will be retained after browsing tab is closed. User Agent Switching – It has options to load web pages either as tranditional iphone user agent or a desktop browser, giving additional more flexibility in accessing web sites and quick discovery of video content. Full Screen Browsing mode – There is a fullscreen button to toggle between normal and the full screen browsing mode. The new Skyfire is currently available in US App Store at $4.99 so do grab one to enjoy a much feature-rich social networking web browser integrated with Facebook, Twitter, Google Reader, Delicious and many more.